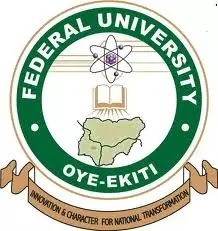 Continuing Education Centre of Federal University Oye-Ekiti invites applications from suitably qualified candidates for admission into the Joint Universities Preliminary Examination Board (JUPEB) Programme for 2017/2018 Academic year commencing from September 2017. The Programme shall run for one academic session of two semesters beginning from September 2017 to July, 2018. During this period, students would be exposed to a broad-based intensive training which would prepare them for the JUPEB examination. Engineering (i)Agricultural and Bioresources Engineering (ii) Civil Engineering (iii) Computer Engineering (iv) Electrical and Electronics Engineering (v) Materials and Metallurgical Engineering (vi) Mechanical Engineering (vii) Mechatronics Engineering Physics, Chemistry, Mathematics. Education (i)Science Education (Agric. Education; Biology Education; Chemistry Education; Library and Information Sci., Mathematics Education) (ii) Educational Foundation (iii) Business Management (iv) Business studies and Educational Management Relevant subject combinations as listed for other Faculties.
. Candidates who voluntarily withdraw from the programme would not be refunded.